Wednesday was cut down day for Team USA at the World Junior Summer Showcase in Kamloops, British Columbia. Brady Tkachuk, Logan Cockerill and Joel Farabee will continue with the US squad while David Farrance and Jake Wise were among the cuts. Shane Bowers is the lone Terrier on Team Canada. Beginning today, the U.S. will play three exhibitions against Sweden, Finland and Canada, all televised on the NHL Network. Game time today is 4 p.m. EDT. Earlier this week, Farabee scored twice in USA White’s 7-5 win against Canada Red. Tkachuk set up the game-winner in USA Blue’s 3-2 win against Canada White, while Wise’s backhand pass to the slot set up Team USA’s first goal. Commenting on the roster cuts, ESPN’s Chris Peters tweeted, “"Biggest surprise for me based on body of work is Jake Wise..."
►Tkachuk has told NHL.com’s Mike Morreale that he’ll decided whether to return to BU for his sophomore year or sign with Ottawa by Aug. 12. The HockeyWriters.com examined the pros and cons for both choices. 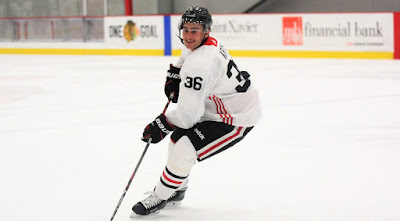 ►The Athletic talked with junior defenseman Chad Krys about the upcoming “pivotal year in his development.” A 2016 second-round Chicago draft pick, Krys recently attended Blackhawks development camp. 2019 recruit Trevor Zegras is moving up in many early rankings for the 2019 NHL Entry Draft. Future Considerations ranked him at #25. 2019 recruit Liam Gorman, a sixth-round Penguins draft pick this past June, talked with NHL.com about the NHL combine, draft day and his experiences in Pittsburgh’s development camp. The 6’3” left-shot center from Arlington, Massachusetts had a 17-16-33 scoring line in 30 games for St. Sebastian’s as a teammate of 2020 recruits Liam Connors and Drew Commesso. Connor LaCouvee, who played at BU for three seasons before becoming a graduate transfer at Minnesota State, is back East after signing with the ECHL Maine Mariners (a NY Ranger affiliate). In a Q&A interview, he talks about committing to BU and his recent trip back to Boston to walk with his graduating class. 🚨 SIGNING: Welcome back, Nick Roberto! Former @shattuckstmarys & @TerrierHockey F Chase Phelps (Edina, MN) has signed with the ECHL’s @FWKomets. Former Terrier All-American Chris O’Sullivan begins the 22nd season of the O’Sullivan Hockey Academy in Quincy. O’Sullivan, who was the Most Outstanding Player in the 1995 NCAA Championship game (video, BU 6-Maine 2) is now a pro scout for the New York Islanders and the owner of the Mark Bavis Arena and Canton Sportsplex.